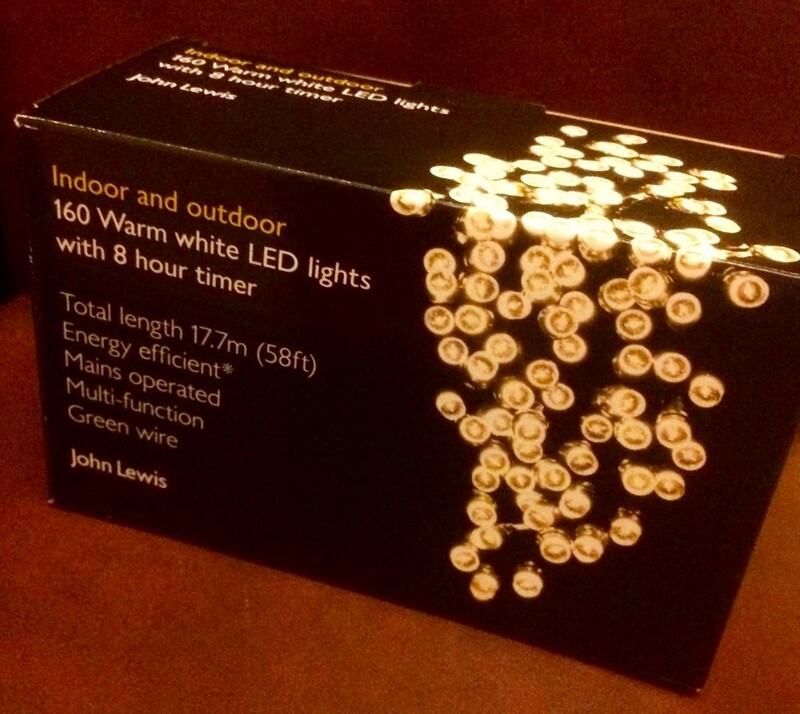 Home / John Lewis 2015: Indoor and outdoor 160 Warm white LED lights with 8 hour timer. 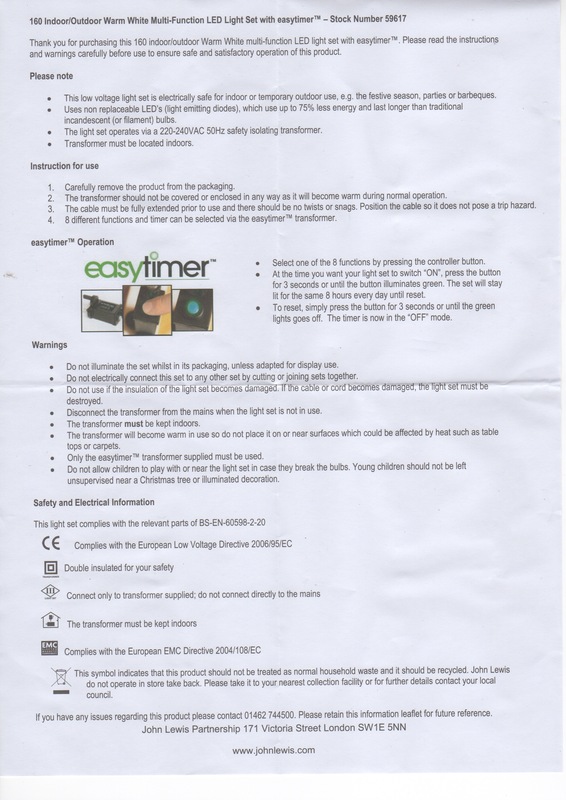 Picture of the instruction sheet. Thank you for purchasing this 160 indoor/outdoor Warm White multi-function LED light set with easytimerTM. Please read the instructions and warnings carefully before use to ensure safe and Satisfactory operation of this product. This low voltage light set is electrically safe for indoor or temporary outdoor use, e.g. the festive season, parties or barbeques. Uses non replaceable LED’s (light emitting diodes), which use up to 75% less energy and last longer than traditional incandescent (or filament) bulbs. The light set operates via a 220-240VAC 50Hz safety isolating transformer. Transformer must be located indoors. Carefully remove the product from the packaging. The transformer should not be covered or enclosed in any way as it will become warm during normal operation. The cable must be fully extended prior to use and there should be no twists or snags. Position the cable so it does not pose a trip hazard. 8 different functions and timer can be selected via the easytimerTM transformer. Select one of the 8 functions by pressing the controller button. ?At the time you want your light set to switch “ON”, press the button for 3 seconds or until the button illuminates green. The set will stay lit for the same 8 hours every day until reset. To reset, simply press the buttonfor 3 seconds or until the green lights goes off. The timer is now in the “OFF” mode. Do not illuminate the set whilst in its packaging, unless adapted for display use. Do not electrically connect this set to any other set by cutting or joining sets together. Do not use if the insulation on the cable becomes damaged. If the cable / core is damaged the set must be destroyed. Disconnect the transformer from the mains when the light set is not in use. The transformer must be kept indoors. The transformer will become warm in use so do not place it on or near surfaces which could be affected by heat such as table tops or carpets. Only the easytimerTM transformer supplied must be used. Do not allow children to play with or near the light set in case they break the bulbs. Young children should not be left unsupervised near a Christmas tree or illuminated decoration. This symbol indicates that this product should not be treated as normal household waste and it should be recycled. John Lewis do not operate in store take back. Please take it to your nearest collection facility or for further details contact your local m council.